Take full advantage of the warm, sunny days of summer right in your own yard! Decorate your patio and balcony with our collection of potted arrangements and artificial plants made specifically for outdoor use. A large number of our outdoor collection are guaranteed two years against UV discoloration. 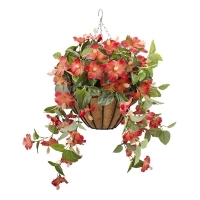 All you need to do is place them in your yard and enjoy - no maintenance required! 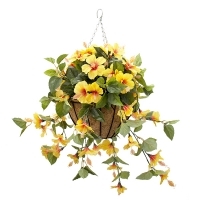 If you prefer the look of flowers, opt for potted floral arrangements, hanging arrangements or flower boxes! These floral arrangements are filled with stunning artificial geranium flowers and hibiscus flowers that will be in bloom all year long. You can even find a selection of floral centerpieces to make your outdoor table decor more inviting. 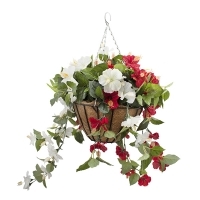 If you're looking to create your own outdoor floral compositions we have all the essentials available for you, from hanging pots to suspended plants made for your outdoor decor. Not really looking for flowers! 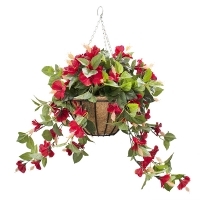 Let our outdoor artificial plants and shrubs become your new favorite! You'll find a selection of artificial cedars, river grass and boxwood balls of all sizes. If you prefer a more exotic feel in your outdoor space, you'll love our high-quality fake agave and palm trees - perfect for your pool area. In our Outdoor Planters section, you'll find all of the essentials that you'll need to show off your new faux botanicals. Your flower boxes will have never looked this good! Don't forget to read our article on how to choose the right pot for your space. Finally, to make sure that whatever's in your yard remains your business, make sure to have a look at our expandable privacy fence panel made with artificial foliage. It works as a privacy screen that also adds an aesthetic element. Show us how you style your Décors Véronneau products by using #veronneau with your pictures on Facebook and on Instagram. Enjoy the warm weather!